We turn to IKEA for everything from flat-pack furniture to household essentials like coffee filters, but if you only visit the Swedish retailer when you’re redecorating, you’re missing out. With such a wide variety of goodies to choose from, it’s also a great resource for affordable gift ideas for every type of recipient in your life—from that random Secret Santa exchange you were coerced into, to tracking down the perfect hostess gift. Trust us: Your giftee will never guess these thoughtful finds came from a big box retailer. Simple, elegant, and inexpensive, these champagne coupes make a great present for anyone who loves to entertain. Pair a set with a champagne bottle for the perfect pre-New Year’s Eve gift. This carefully crafted decor piece works on its own as a sculptural object or filled with fruit. 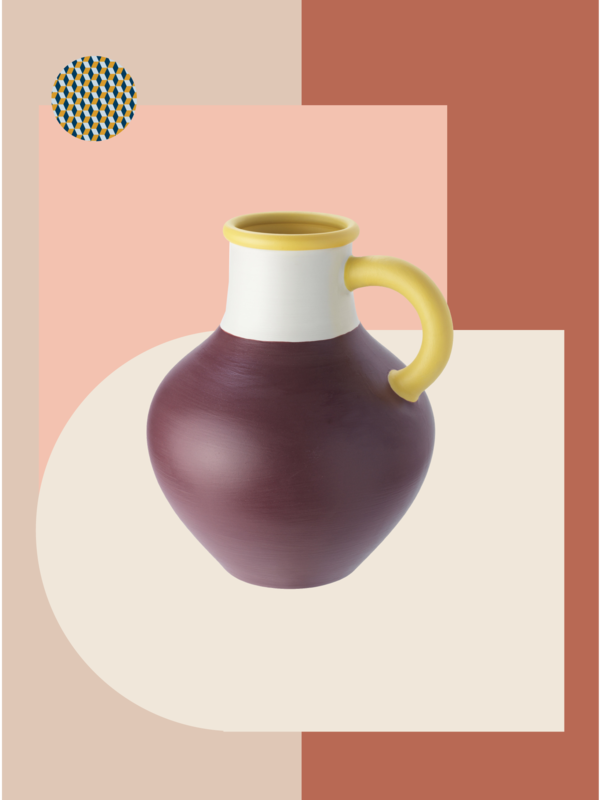 This hand-painted stoneware vase looks like you picked it up in a little artisanal market during your travels—no one will ever be able to tell it was under $20 from a mass retailer. If you fear for the lives of your gift recipient’s potential plants, help them incorporate greenery in a less risky way. These botanical watercolors will bring a touch of the outdoors in. Choose a colorful bulb or glass pendant to wash any room in color—it’s one of our favorite low-lift decor hacks. This pink orb-shaped lamp comes with an LED bulb, so it’s eco-friendly too. If you’re willing to spend a bit more—and your gift recipient would be open to getting something bulky—this yellow seating option is the way to go. Part of IKEA’s celebrated Industriell collection, this chair is sure to infuse a pop of color into any corner it’s placed. This jute rug makes a great entryway or kitchen accessory. Rustic and understated, it’s perfect for boho friends. This sleek vase embodies Scandinavian simplicity— it’s a great find for the minimalists in your life. A subtle blue tone adds a hint of color and dimension to what is likely a neutral-washed space. Gift a statement-making retro red pendant to the person on your list who recently moved. It’s a functional present sure to become the focal point of their dining room. Arguably one of the most useful things you could give, a woven basket works wonders for storage and the style of a room. This one is totally customizable—just press the handles in for an entirely different look. A deep terracotta hue makes this textile feel different from the plethora of traditional blue-and-white striped throws on the market. Given that we’re about to head into the depths of winter, we’re sure anyone would appreciate an extra way to stay cozy. Help out the green thumb on your list with some chic gardening tools. No, that’s not a mistake; just look at this mod brass handle! Your giftee will want to keep this watering can displayed on their windowsill right next to their favorite plants. This flatwoven wool rug is such a smart gift for the colorphile in your life. The color combo of coral and soft blue-gray is quite striking; plus, thanks to its composition, it’s naturally soil-repellent and durable, so it’ll be able to withstand wear and tear. A set of fun glassware is always a safe bet. The perfectly imperfect splatter dot print is the only detailing needed on these otherwise simple glasses. In a pinch, they make a great hostess gift. Navy is a timeless hue that always adds sophistication to anything in touches—in this case, someone’s sofa or armchair. Gift a pair of these to the person on your list with an interest in collecting textiles. This set is made for vignette-crafting. The size disparity is what makes them so interesting when grouped together; be sure to gift alongside a set of simple cream tapered candles for the total stylish package.